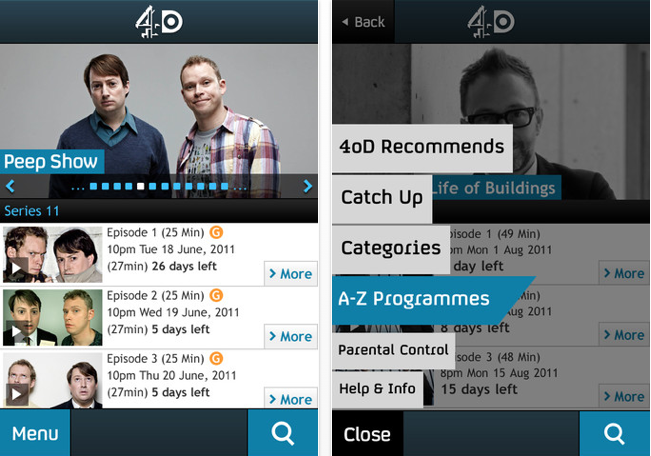 Popular UK TV broadcaster Channel 4 has brought its 4oD catch-up service to the iPhone today for the first time. Its iPad app has been updated to become a universal offering, compatible with the iPhone and iPad Touch too, meaning that you can can get up to date with TV shows on the go a little more subtly than having to pull your tablet device out on the bus. Also new to the updated version is a search facility for finding available shows, and a ‘download to own’ feature which allows selected shows to be purchased from iTunes right from the app. This is a feature which we recently noted as being useful in an unreleased pitch video from a company which didn’t end up getting commissioned to make the app. So, it’s good to see it making its way into the ‘real’ app too. Version 2.0 of the iOS app follows the recent relaunch of the Web-based version of the service, which added new personalisation features. The new version of the app is compatible with devices running iOS 4.2.1 and above and is available in the UK for free now on the App Store.